didn't thaw until the eve of World War II. He hung out in the back pages of DC's Adventure Comics, along with Manhunter and Genius Jones, but was never once spotted on the comic's cover. Sir Justin made his debut in the 66th issue (September, 1941), in a story drawn and possibly written by Creig Flessel, who was also associated with several of DC's other early superheroes. Despite Flessel's primacy, the artist most associated with the character is Frank Frazetta, who drew eight of his stories in 1950 and '51. Frazetta has credits all over the comics industry, from Vampirella covers to assisting on Li'l Abner, but is probably best known for his paintings illustrating the fiction of Edgar Rice Burroughs and Robert E. Howard. The Shining Knight's second-class status among the Adventure Comics characters extended to more than merely his placement in the magazine and his lack of cover promotion. Whereas The Sandman and Starman, who between them were on most of the early '40s covers, made it into the prestigious Justice Society of America, Sir Justin was merely a member of The Seven Soldiers of Victory. But what he lacked in status, he made up in longevity. In 1946, DC transferred the superheroes of More Fun Comics to Adventure. Superboy became the cover feature, and the comic's former stars were out of business. Alone among the Adventure Comics series, The Shining Knight stayed right where he was. He hung on in the back pages until July, 1951, appearing in a total of 101 consecutive issues. Like most DC characters, he's been back. In 1972 The Seven Soldiers of Victory turned up in the annual Justice League/Justice Society get-together. Like practically all the 1940s costumed guys DC owns, he was an associate of The All-Star Squadron, a '40s retro series published in the 1980s. He's also made minor guest appearances here and there over the years. On the one hand, that seems like a pretty decent fate for a character who was always so minor. 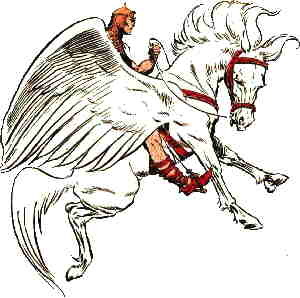 On the other, one would think a winged horse would be a visually appealing enough prop to get a guy better billing now and again.